Super Bowl time! If your team isn’t in the game and you need a way to make the big game more exciting then it’s time to fill out your Super Bowl Prop Bet sheets! The prop bets range from ‘who will score first?’ to ‘what will the halftime performer wear?’ It’s time to discuss a few of my favorite bets this year. Prop Bet #1: Which team will score first? This one seems contingent on the coin toss, but the Patriots have chosen to defer almost the entire year up until the AFC Divisional Game. Something else to think about… the Pats haven’t scored a touchdown in the first quarter of any of the Brady/Belichick Super Bowl Games. They’ve actually only scored 3 points in the first quarter of all of their Super Bowls combined (they kicked a field goal last year against the Eagles). If history can teach us anything, it’s the Rams that will score first. Prop Bet #2: Will the jersey number of the first player to score be odd or even? This one is interesting because both teams have an equal amount of odd and even numbered jerseys who are likely to score. It really depends on your answer to the first Prop Bet. If you believe the Patriots will score first, then you have a dilemma on your hands because according to the regular season numbers, James White is most likely to score a touchdown and wears an even number, but their kicker Stephen Gostkowski wears an odd numbered jersey. The prop doesn’t specify whether it has to be a touchdown or a field goal, so kickers will play a large part of this prop. Three of the five players on the Pats that are most likely to score a touchdown are even numbered. On the other side, the Rams have an even numbered kicker and Todd Gurley, their player most likely to score a touchdown according to regular season data, also wears an even numbered jersey. The numbers point to a player with an even numbered jersey scoring first. Prop Bet #3: What color will the Gatorade bath be? There are some things we need to take into account. Oddly enough, all of the “None” results have happened inside domes. You’d think weather would be a factor in the “None” results but I guess not. The “Orange” baths took place outside with the exception of 2011 which was at AT&T Stadium in Texas and it has a partially open roof. “Yellow” split between outside and in and the lone “Blue” of the past 10 years took place outdoors in Miami. This year’s Super Bowl is being held in a dome in Atlanta. Perhaps the players are asked not to give Gatorade baths in domes because of the potential damage to the artificial playing surface. I honestly don’t have a clue. I guess “Orange” might be the conventional bet, but I’m going with “No Bath” because I think I might be onto something with this artificial surface nonsense. 1. Las Vegas has the New England Patriots favored to win by 3 points. 2. The Rams Aaron Donald won the Defensive Player of the Year Award. He and his teammate, Ndamukong Suh, are absolute monsters at creating pressure up the middle. Per the twitter account @NFLResearch, Brady can handle pressure off the edges (118.7 Passer Rating), but struggles mightily against interior pressure (63.1 Passer Rating). Look for Aaron Donald and his defensive line to make or break this game for the Rams. 3. What do I wear? Twelve of the last fourteen Super Bowl winners have worn white uniforms. The two teams in that timespan to win while wearing something other than white, have both worn green. The 2011 Green Bay Packers and the 2018 Philadelphia Eagles are the only teams to beat the Curse of the White Jersey. 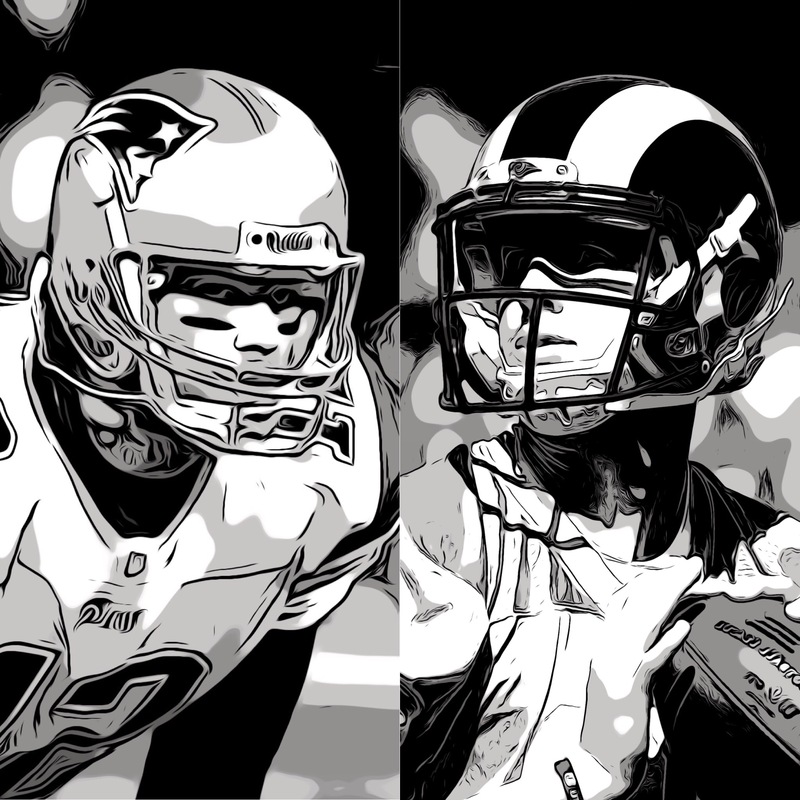 The Patriots will be wearing their white uniforms on Sunday and the Rams will be hoping to beat the curse in their Blue and Yellow throwback jerseys. 4. Who are the big guns betting on? Bettor X, as he’s known in the betting world, has had major success over the past couple of years. After winning big on eleven UFC fights in a row, he turned his sights on baseball. He bet on Games 1-6 of the 2017 World Series in increasing increments with the largest being $800,000 on Game 6. He, reportedly, walked away from the World Series with around $10 million in winnings. Then came the 2018 Super Bowl where he placed several bets all over Las Vegas. He made a $3 million dollar bet at the MGM, which is their second largest Super Bowl bet ever. He also made several, around $700,000 dollar, bets around town that totaled $6 million and his winnings resulted in him doubling his money. His large wagers and incredible win streak have earned him the nickname “Biff Tannen”. As some of you may know, Biff Tannen famously used a sports almanac from the future to place bets in the movie Back to the Future 2. Why am I telling you all of this? Because Bettor X placed a large wager on this year’s Super Bowl. He reportedly placed a bet of at least $3.8 million dollars on… drum roll please… the Los Angeles Rams. Take that information and do what you will with it.